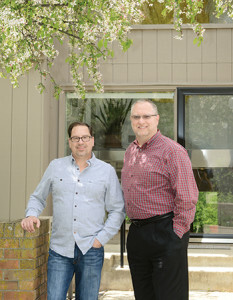 Joe Raetz (left) and Brad Holland appreciate the combination of convenience and privacy their condo offers. Downsizing is never easy, but Brad Holland and Joe Raetz were heading in that direction when they came across a condo in The Park at Southern Hills complex. Built in the late 1970s, the condo had just been remodeled by Teresa Van Vleet-Danos, owner of Rowat Cut Stone & Marble Co. It was the second unit in the complex that Van Vleet-Danos had transformed, and the split-level floor plan and dark, boxy rooms had posed a challenge. To open up space in the lower level and bring in more light, she replaced load-bearing walls with structural beams recessed into the ceiling and additional structural support in the crawl space. She also installed a narrower but more substantial beam to support the upstairs hall, allowing more headroom for the revamped staircase that leads downstairs. To bring more light into the living room, Teresa Van Vleet-Danos opened up the wall beside the fireplace and replaced the staircase to the upper level with floating steps. She also extended the adjacent wall to accommodate changes to the steps leading downstairs and removed the wall dividing the living room from the dining room. The additional light meant she could replace the 1970s mirrored fireplace surround with granite facing to update the look. New cabinetry flanking the fireplace accommodates media equipment. White walls and creamy travertine floors create a neutral backdrop for the furnishings Brad Holland and Joe Raetz already had or acquired to suit the new space. Van Vleet-Danos re-imagined the entire downstairs space, creating one large U-shaped area with the kitchen at one end and the living room at the other, connected by the dining area and a small bar. Cotton-color cabinets and honed limestone countertops along the end wall play up the 9-1/2-foot-long granite island. Van Vleet-Danos recessed new support beams into the ceiling to create an unbroken surface overhead, enlarging the sense of space. Holland and Raetz snagged the table and Parsons chairs at a neighborhood sale and brought color into the space with artwork. The original design took guests down steep, narrow stairs to a hallway that ran the length of the condo. Van Vleet-Danos widened the stairway and made the steps shallower, creating a more graceful, gentle descent that accommodates traffic better. Removing the walls also opened up the view from the foyer to the back of the condo, creating a more welcoming feeling. On the short wall in the kitchen, Van Vleet-Danos continued the travertine from the floor to the wall, installing it as planks to visually widen the space. To open up the foyer, Van Vleet-Danos replaced the original half-walls up the stairs and along the hall with glass and brushed stainless steel. Eliminating the closet that bumped out into the space widened the hall, creating the perfect backdrop for an installation piece by retired Des Moines architect William Anderson. The new back patio, which overlooks trees and a creek, matches the floor level of the living room and kitchen, creating an easy flow for indoor-outdoor entertaining. The sawtooth arrangement of the units gives each one privacy at the back. Jack Bloodgood, a onetime building editor at Better Homes and Gardens magazine, founded Bloodgood Architects (now BSB Design) in 1966 and went on to have a major impact on residential architecture. 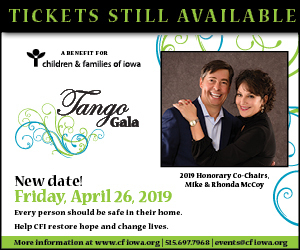 The recipient of many awards and honors over his long career, Bloodgood is credited with changing the housing industry by introducing architect-designed stock house plans and such innovations as indoor-outdoor living spaces, family rooms and multipurpose dining rooms. The Park at Southern Hills was built in 1978. Bloodgood died this past January at the age of 83. 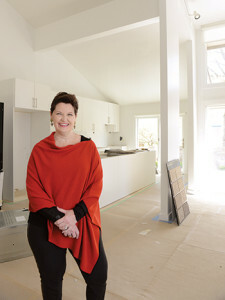 Teresa Van Vleet-Danos is no stranger to home renovation. The owner of Rowat Cut Stone and Marble Co. has been remodeling properties for rental or sale for more than 30 years. One of her latest projects has been revitalizing condos at The Park at Southern Hills, designed by the legendary Des Moines architect Jack Bloodgood. So far, Van Vleet-Danos has reworked three units, opening up spaces, overhauling kitchens and baths, and updating all surfaces and systems to meet 21st-century expectations. She even provides the appliances, sets up the security system and installs sensor-activated outdoor lighting, so all a buyer has to do is move in.